My granddaughter Addison's 4th birthday is coming up next weekend, and this is the card I made for her. This little girl's name is Birthday Balloons Ellie from Paper Nest Dolls. I colored her in with my Promarkers using almost the exact colors as the picture of her that comes with the packaging.... I knew I had some cute birthday paper that would match the colors perfectly! 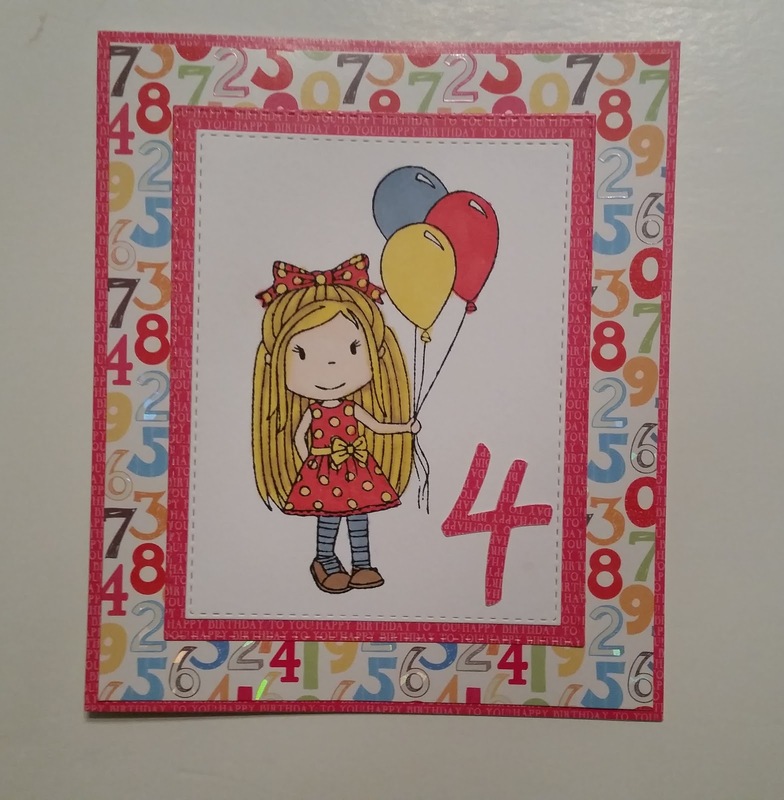 I used a stitched rectangle die to cut her out, and both the red printed paper & numbers paper behind her are from a 6x6 DCWV stack called The Birthday Wishes Stack. 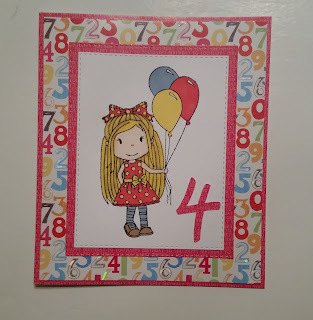 I cut the number 4 out with my Cricut using the same red printed paper. I think it turned out cute! Thanks for stopping by! Such a pretty creation and lovely bright colours, many thanks for joining us at Stamping Sensations and Penny Black and More challenges. Very cute card for a 4 yer old little girl! My granddaughter is Addison also!! Thank you for sharing this at Seize the Birthday! very cute and adorable she will love it thanxx for playing with us at little patch of crafty friends ..
Super cute! Great colours and colouring. Thanks for playing along with Seize the Birthday. This is lovely! So cute! Thank you for joining our challenge at Lil Patch of Crafty Friends! Simply adorable! The background paper goes so well with the image. Any little girl would love this. Thanks for sharing it with us at Stamping Sensations. Beautiful creation, lovely colours and design. Thanks so much for joining us over at Lil Patch of Crafty Friends. I'm sure your granddaughter will love this bright cheerful card. Just perfect for a four year old! This is perfect for our current challenge “Anything Goes ” at Pattie’s Creations. What a cute image too! Thanks for joining us!